Diverse stakeholder engagement is often the number one goal of Corporate Social Responsibility communications. Yet, the industry suffers from a tendency to churn out jargon, which may not appeal to all of your intended audiences. Phrases like "natural capital" or "ambition loop" may cause confusion or even irritation to people who have never heard them before, so it's best to err on the side of caution. Unless you can effectively communicate the benefits of such concepts to different audiences, the terms alone will not help persuade them. The word "sustainability" itself has suffered harsh blows in the world of advertising. Its reputation as a wishy-washy concept was sealed when it landed on Ad Age's Jargoniest Jargon list in 2010. The definition of sustainability has been linked to an economic development context since its inclusion in Our Common Future, the 1987 Report of the World Commission on Development, also known as the Brundtland Commission. The report defines "sustainable development" as "development that meets the needs of the present without compromising the ability of future generations to meet their own needs." With an emphasis on the interrelationship of human needs and environmental limits, the term "sustainable development" came pre-packed with a range of discursive possibilities. Unfortunately, people have used the adjective "sustainable" so liberally, it has lost its bite. In its noun form, "sustainability" runs the risk of migrating to contexts that have nothing to do with environmental protection or social responsibility. When using the term, we should provide plenty of contextual cues to make its intended use clear. Here are some additional tips to consider before adopting sustainability jargon into your lexicon. In some cases, jargon can have a number of perceived benefits. It offers insider appeal, making people who are familiar with the term part of a community. This can have a beneficial effect when you want to rally around an idea. Having characteristic terminology to an innovative field like sustainable business development can also generate interest from outsiders, as these words often represent novel concepts. On the flip side of any innovation, however, there are always detractors. Many people remain hesitant to latch onto an idea with characteristic terminology before it has reached a critical mass of acceptance. Others are often unaware of new phrases simply because they are not widely known terms. For both groups, new jargon can appear to pose an elitist or exclusive tone. In addition, domain-specific terminology can burden your text with a learning curve, distancing readers who aren't familiar. You also take a risk with new buzzwords because they may fall out of fashion quickly. Or, if a specific phrase becomes too familiar, it can start to sound cliché. For all of these reasons, you shouldn't automatically assume that the clever sounding jargon will enhance your message. If and when you decide to incorporate jargon into your communications, it is necessary to state in clear terms what you are referring to. Much like describing a foreign food or cultural practice, you should follow industry jargon with a brief explanatory definition in layman's terms. Keep in mind that the point is not to indoctrinate your audience into your worldview, but to ease the cognitive dissonance caused by unfamiliar language. For example, Fairphone promotes itself as the creator of the world's first "ethical, modular smartphone." But without the following sentence, this phrase may not strike a chord. They continue: "You shouldn’t have to choose between a great phone and a fair supply chain." With this added sentence, we find out that the company's ethical stance specifically relates to its supply chain. The vision of the company transforms from a series of jargon to a meaningful context that conveys a distinct purpose. 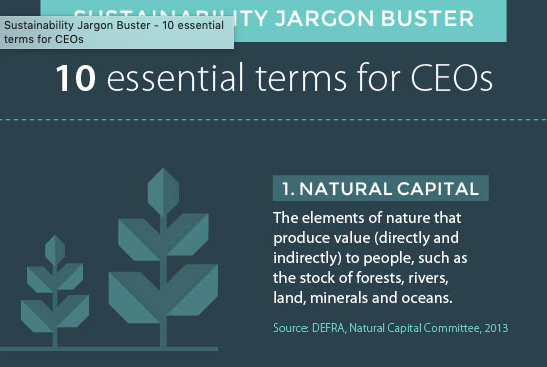 Noting the knowledge gap between the visionary sustainable development folks and the average CEO, the Natural Capital Forum created a Sustainability Jargon Buster Infographic that spreads awareness about ten critical, though potentially confusing terms. Such a resource helps the business community audience to give these ideas serious thought rather than split hairs over the terminology. In another example, the Edie Conference on Energy, Sustainability and Resource Efficiency developed an extensive jargon busting glossary of terms to assist audience members of different panels. The mere existence of such a resource demonstrates the unique dilemma sustainability communications professionals face when introducing concepts that define their vision. A particularly high number of phrases are not commonly circulated outside of sustainability contexts. Another approach taken by SustainAbility in this infographic on business innovation models is to use graphic images to illustrate the jargon-laden concepts. This way, a handy visual representation portrays the verbal explanation to "show" rather than "tell." To take the guesswork out of the perceptions towards different phrases used in your industry, you can even collect data to support your communication decisions. This is what the Shelton Group did in its 2015 Ecopulse Report. This report compiles data regarding reactions to words such as "green," "sustainable" and "eco-friendly," from across spectrums political preference, age and gender. Its findings show that while many terms used in sustainability contexts are no longer met with distaste, they may be misinterpreted. For instance, the majority of respondents considered "renewable" positive, but most could not accurately identify which energy sources are "renewable." Such studies are useful for general audiences, but conducting surveys with your own stakeholders could also help you navigate their attitudes towards your branding message. No matter how excited you are about sustainability, keep in mind that not everyone shares your passion. Yet. Think of how it feels to be the newcomer among a close knit group of friends. You can't expect a newcomer to understand all of your inside jokes, nor can you expect them to care until you bring them into the fold. The same goes for newcomers to sustainability. Your communication strategy should help ease them in. What are the 7 R’s of sustainability?